The concepts of the day trading system which you will learn here and which I teach since 2012 can directly transform you into a winning trader! The V-Power Day Trading System works on forex and on other liquid markets like commodities and stock indices. With this system you will be directly exploiting the behavior of the smart money. You will probably get a complete new view on the financial markets. And if you use this day trading strategy as the entry method into longer term trades then you will even dramatically boost the outstanding performance! You can use the V-Power system for day trading and longer term trading. After reading this page you will be able to use the day trading entry technique to enter into big and strong moving trends. Then you will be able to enter trades of highest quality on a regular basis and you will join the absolute elite club of professional traders. And one additional benefit of the V-Power system is that you will be able to trade this concept even besides a normal day job and when you have only limited time for the charts! The automation possibilities of the V-Power system makes it possible for you. Now that you have, hopefully :), read the 5 articles you have learned about the 3-day-cycle of the smart money. And you should now understand why entering as early as possible into a new cycle is extremely important. With the V-Power System you will be able to enter extremely early into the next 3-day-cycle with very high probability of success! 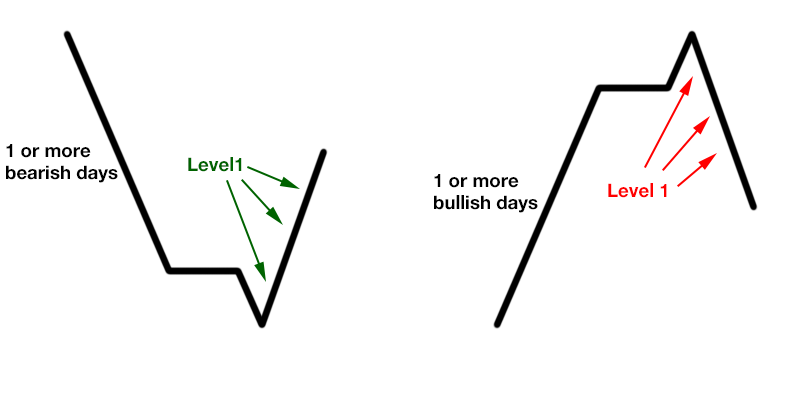 As you read in the article "The Smart Money 3-Day-Cycle" I call the first day of the 3-Day-Cycle Level1. 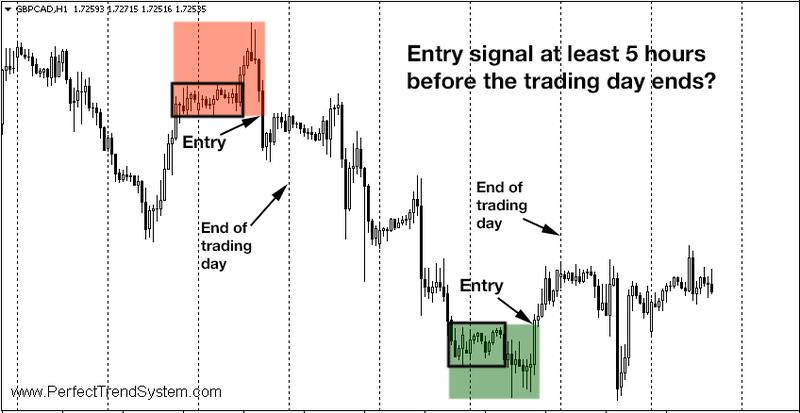 The Level1 is the most important level for entering with the forex day trading strategy explained on this page. Entering early into a high probability Level1 is very rewarding! And the automatic technical analysis of the V-Power Trading System will guide you to high probability entries into these Level1 moves. If you want to enter into high probability trades during Level1 then you can't select any V- or inverted V-shape pattern and hope for a profitable trade. The stop hunt (2) and the sharp reversal (3) are forming the V- and the inverted V-patterns which we are selecting for our entries. What happens during the 3 phases? 1. During the sideward accumulation phase the smart money actively accumulates its long position. The price is not allowed to drop anymore. The smart money absorbs all incoming short orders from the herd. This accumulation is a covered operation from the smart money. At this point nobody knows (including me) that the smart money has actively accumulated a long position and will soon reverse the price and start a new 3-day-upward-cycle. 2. 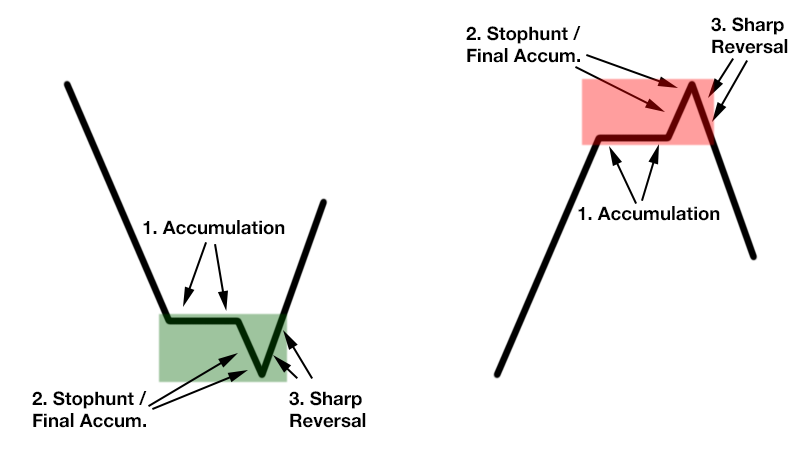 The stop hunt phase (final accumulation) is a fast move out of the sideward channel in direction of the previous day(s). 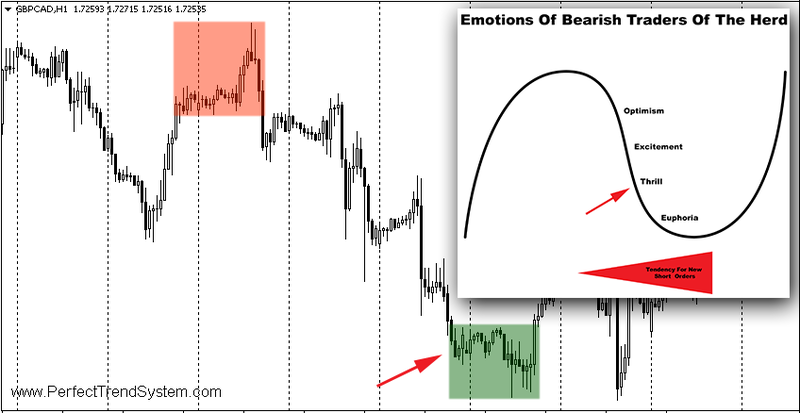 In our bullish V-pattern example it's another fast downward move. This fast move induces a lot of new short traders within the herd. 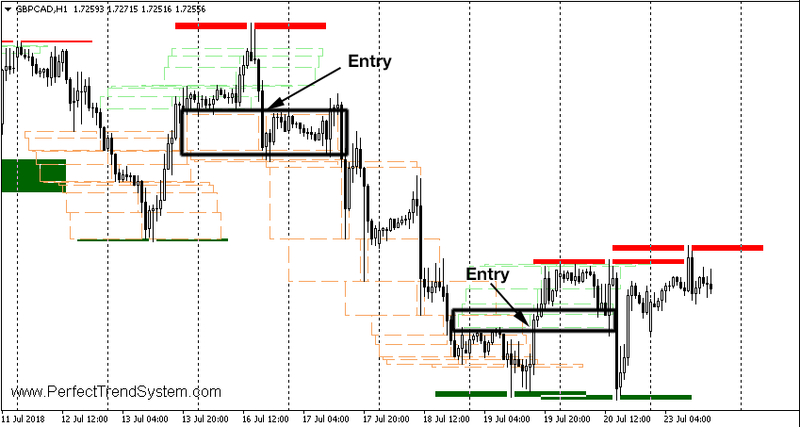 Also protective sell-stop orders of long positioned traders get fished by this move. During the downward move the smart money adds further to its long position. Now the price is stopped again. The smart money absorbs all incoming short orders from the herd. Bullish pin bars and other bullish reversal candles will now emerge. At this point after I see the pin bars I'm already alerted that a great setup can occur! 3. A sharp reversal to the upside with strong bullish full bodied candles will develop. The strong bullish candles will reach the highest high of the sideward channel (accumulation pase) very fast. Now the long entry will be triggered! Now we will see with real chart examples how highest probability V-Power setups look like. The time frame where you search for the entries is always H1! But from the above chart alone you would probably NOT see all necessary information to select these two V-patterns as valid high probability entries. 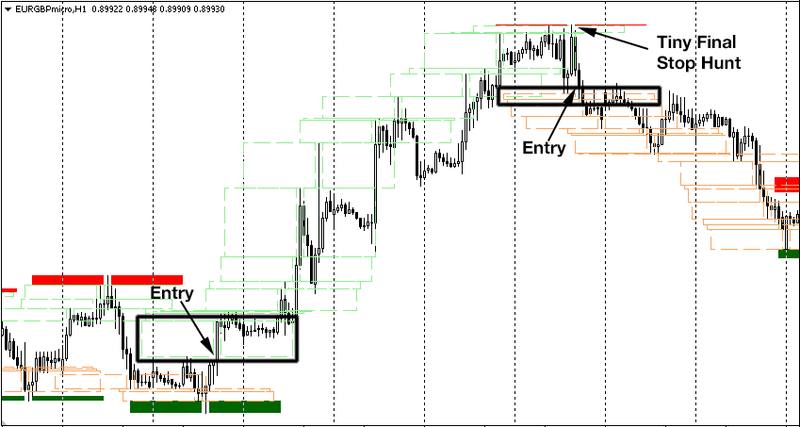 We need to add more structure to the chart and define some rules to make it possible to detect these setups reliable. Because the daily candle closed so strong many of the already positioned traders of the herd will hold their positions during the Asian session. And for the same reason many new traders will prepare for an entry in direction of the strong daily candle. The herd is strong bullish before the bearish reversal and strong bearish before the bullish reversal. The smart money will use this confidence of the herd to dramatically shift the emotions of the herd from thrill/euphoria to anxiety! The more confidence the herd has the bigger will be the emotional shift (from thrill/euphoria to anxiety) when the smart money creates the reversal pattern. 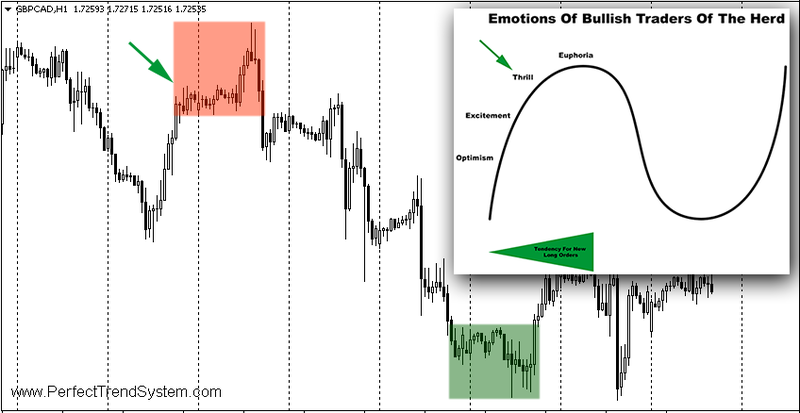 The bigger the emotional shift the bigger the subsequent price move after reversal will be (on average). You can compare the effect of the emotional shift with the temperature of the air. If after a hot day the temperature of the next day is only 5 degrees lower then this small change probably will not have a big impact on you. But if the temperature of the next days is 25 degrees lower then you will feel this temperate shift totally different. It will be like a shock and you will probably talk a few times about the crazy weather on this day. We can now define the first rule for our forex day trading strategy. Search only for V-Power Setups after a day which closes near the high / low of the day! For our highest probability V-Power setups the Asian session should have a special look. The price move during the Asian session should be a relatively tight range. A tight range is a good sign that the smart money is silently accumulating it's own position. The process of actively and silently accumulating a big position from the herd takes time. The smart money must carefully absorb the orders of the herd without producing big price swings against the previous direction. Because it takes time to accumulate silently we will see a tight range which has a duration of many hours. 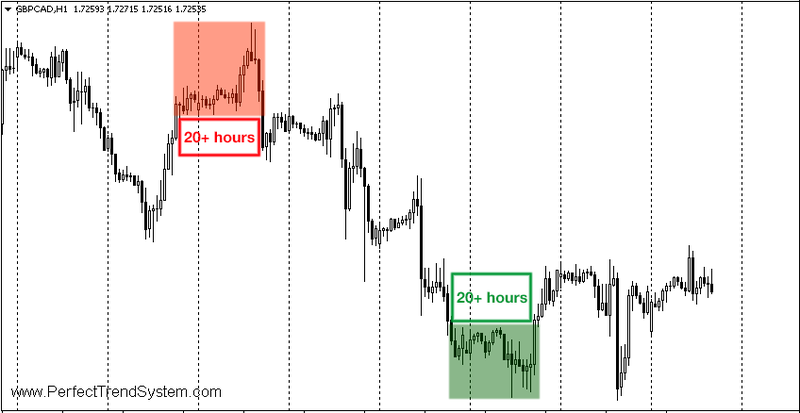 Good ranges have a duration of 10+ hours. 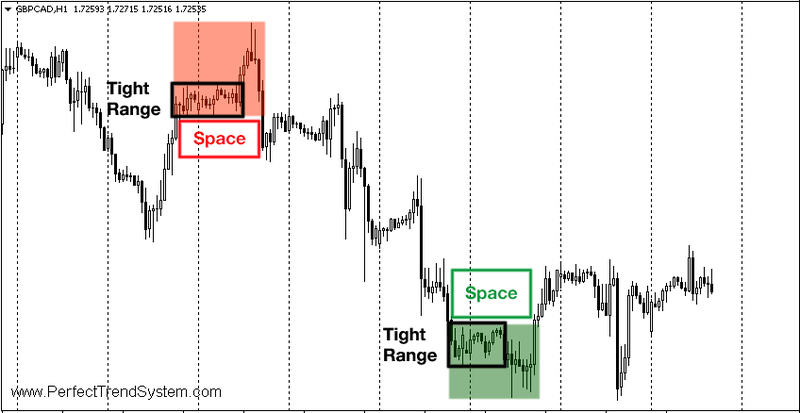 From the explanations above we can now define the second rule for our forex day trading strategy. A tight range must develop during the Asian session with a duration of 10+ hours! For our highest probability V-Power setups we need a special move after the tight range of the accumulation phase. We need to see an additional move into the same direction as the previous day. This move should be not too big. I will explain later why it should be not too big. This additional move brings the herd into the "euphoria"-state. 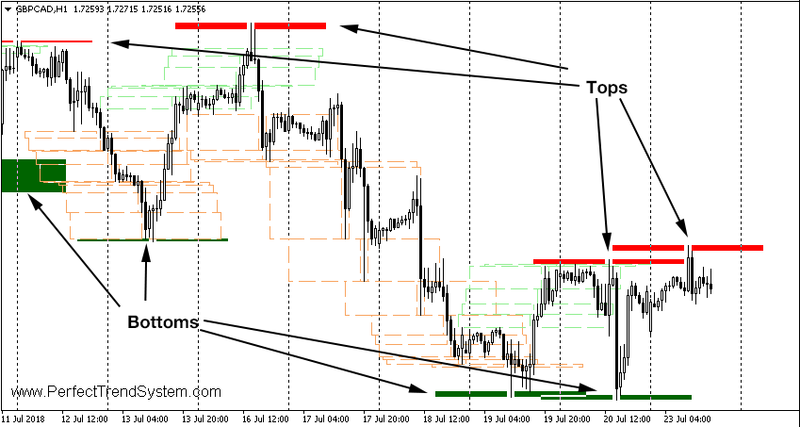 The positions in direction of the trend are in good profit and live as a trader feels easy on that day. 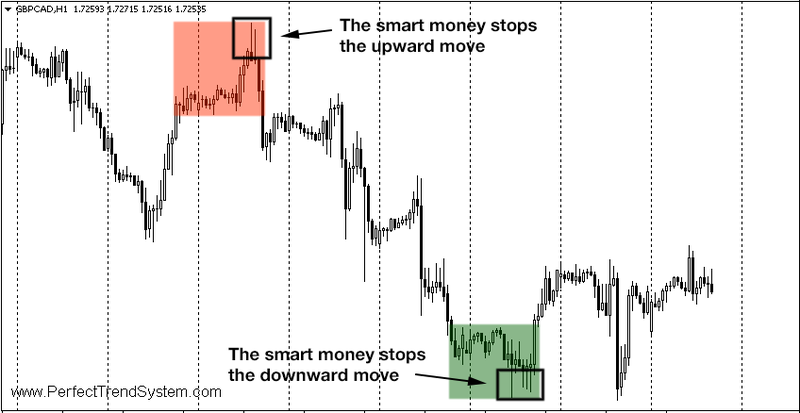 This additional move is the final accumulation trick initiated by the smart money. New traders from the herd are induced with this move and the smart money takes the counter part of those positions. This additional move also grabs protective stop loss orders of many traders of the herd who were positioned against the direction of the trend and now get kicked out of their position by a few pips. From the explanations about the final accumulation by the smart money we can now define the third rule for our forex day trading strategy. After the final accumulation move the smart money will use the emotional shift of the herd from extreme thrill/euphoria to anxiety to make money. The position which the smart money has actively accumulated during the tight range and during the final stop hunt move will now be distributed to the herd at a better price with huge profits. 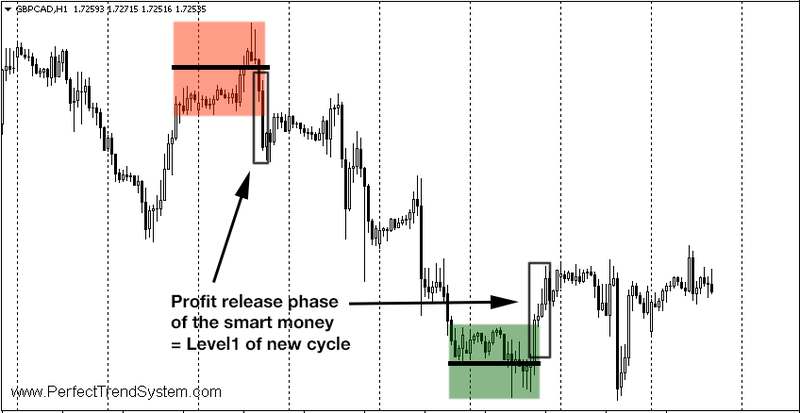 A new profit release phase (a new 3-day-cycle) has started. The smart money stops the move by heavily absorbing all incoming orders from the herd. The smart money now no longer wants to keep their actions secret and allows that very clear reversal candle stick patterns develop. By absorbing all incoming orders of the herd and by additionally aggressively adding to the position at best prices the average price of the position of the smart money gets better. The average price comes nearer to the actual price. On the left side (in the red rectangle) after the price drops below the horizontal (at the black arrow) the short position of the smart money is already in profit. 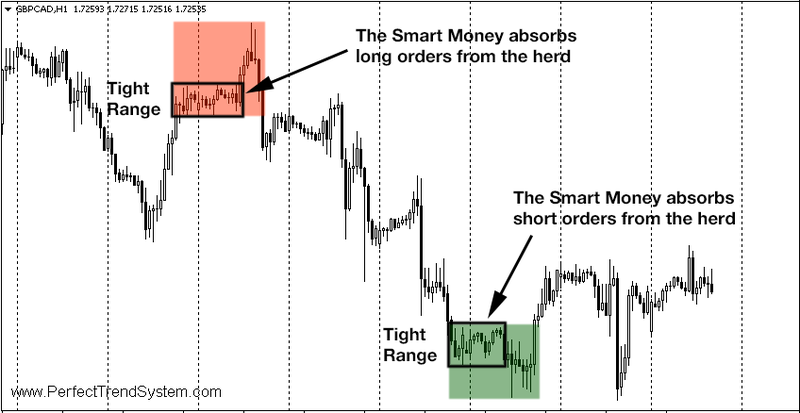 And on the right side (in the green rectangle) the long position of the smart money comes into profit after the price jumps above the horizontal line (at the black arrow). After stopping the trend of the previous 3-day-cycle (with reversal candle patterns) and further adding to the own position the smart money now produces the first strong and full bodied candle(s) against the direction of the previous day. 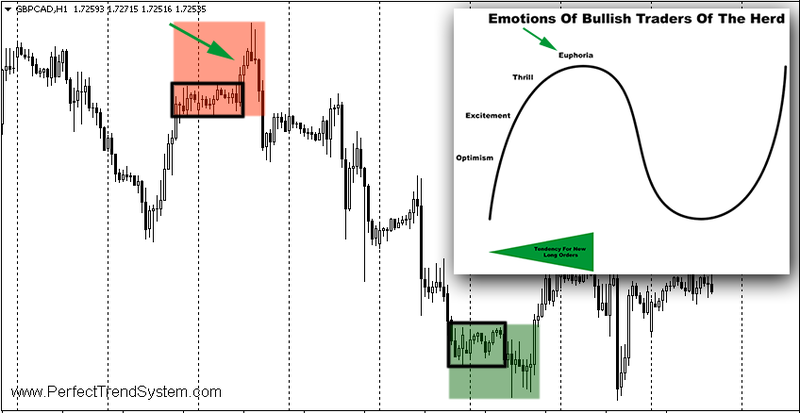 This action forms a sharp reversal on the price chart with which the smart money induces anxiety into the herd. With the sharp reversal against the previous direction the mental shift from thrill/euphoria to anxiety within the herd is now completed! The position of the smart money is already in profit when the traders of the herd start to panic and exit their position. The profit release phase for the smart money has started. With time more and more traders of the herd are closing their position in panic. And the smart money "thankfully :)" takes the counter part of these orders. The panic of the traders of the herd produce the momentum for the Level1 of the new 3-day-cycle. 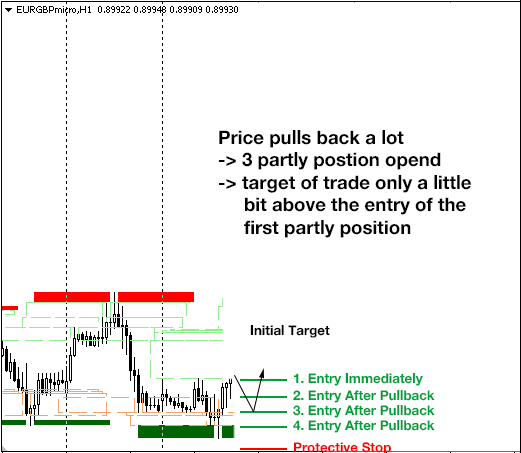 With our high probability day trading strategy for forex we want to select only the best Level1 moves for our entries. The next section will explain in detail how you will be able to do that and how you can even automate the trade entries and exits with the V-Power System. My biggest goal with the explanations on this page is to give you a rule set for detecting the absolute best high quality day trading setups! From my own experience I can't emphasize enough how important it is to trade only highest quality setups. You will have more confidence and a lot less pain during your trading career if you add only the best of the best trading strategies to your arsenal and avoid all mediocre profitable rule sets. To bring the V-Power System into the club of the best forex day trading strategies which I know we need to add two additional rules. These two rules will add enormously to the edge of the system. And as you will see they make totally sense in every aspect. But before I will guide you to these two rules I will show you the entry price levels of the V-Power system. 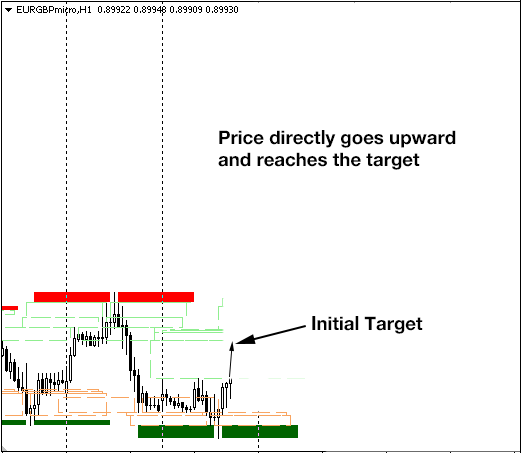 The following screenshot shows you the price levels where you should enter your trades. 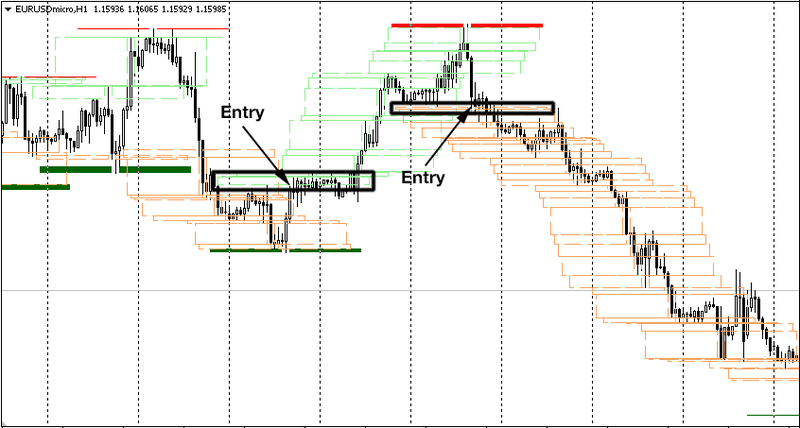 You should enter sell trades when the price gets below of the lower boundary of the accumulation range. 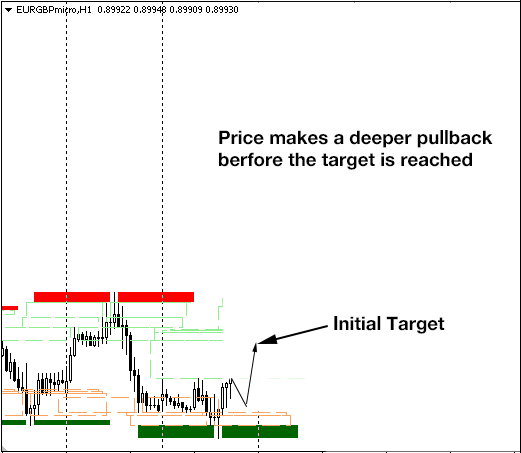 Buy trades will be entered when the price moves above the upper boundary of the accumulation range. 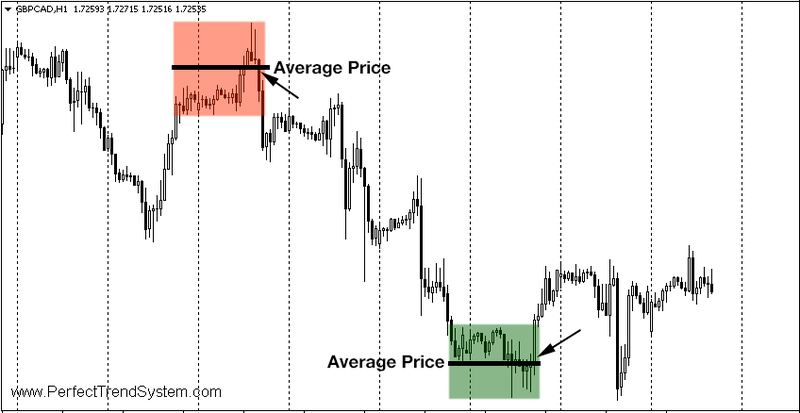 Only after these price levels are reached the inverted Vs (sell trades) and the Vs (buy trades) are completed. These chart patterns gave the name to the V-Power system. But as I said before: Don't trade every V- and inverted V-formations which fulfill the first three rules! For the smart money it takes either a bigger amount of time to accumulate a massive position size or it needs to take out a major support / resistance zone (a price level with big amount of stop orders from the herd). Because we are only examining the signal chart here (the time frame H1) we can't see the bigger picture and can't see the major support / resistance zones. Therefore, we focus only on the time variable here. Because the mega banks aka the smart money will never show us their order books :) we can never know when they accumulated enough to reverse the direction and start a new 3-day-cycle. All we can do is to logically think about how we can further add to the probability of the setups which we will select. As I said before, the silent accumulation within the tight range takes time. The smart money must absorb the orders from herd carefully without reversing the direction of the trend too early. 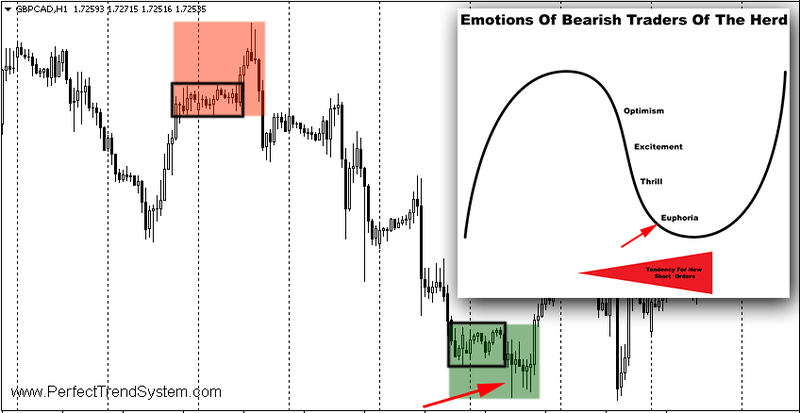 Also the final accumulation move and the subsequent reversal takes time. Then we have massively added to the odds that the smart has accumulated a big enough position size which needs to be further distributed to the herd after we get our entry signal. 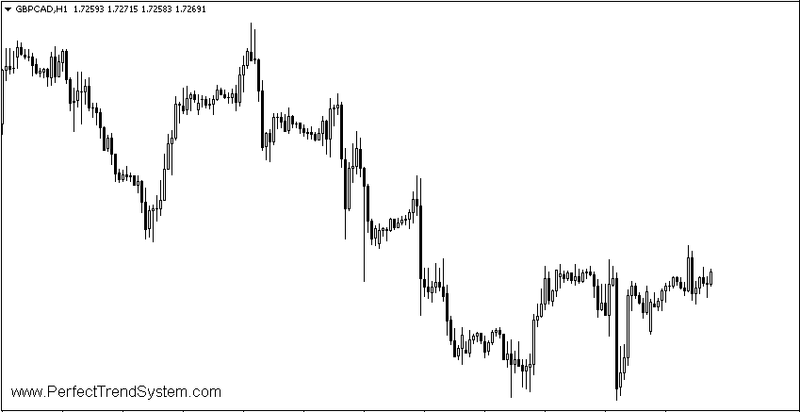 This means that a big enough subsequent move will occur after our entry to give us a good profit on a regular basis. 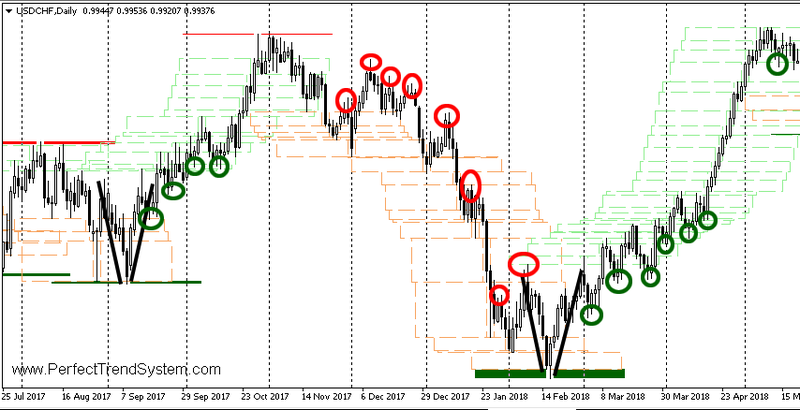 From the explanations about the amount of time it takes the smart money to accumulate a massive position size we can now define the fourth rule for our forex day trading strategy. The next trading rule is a filter which also adds to the quality of the trading setups which you will trade with the V-Power system! This filter is based on sound trading logic. 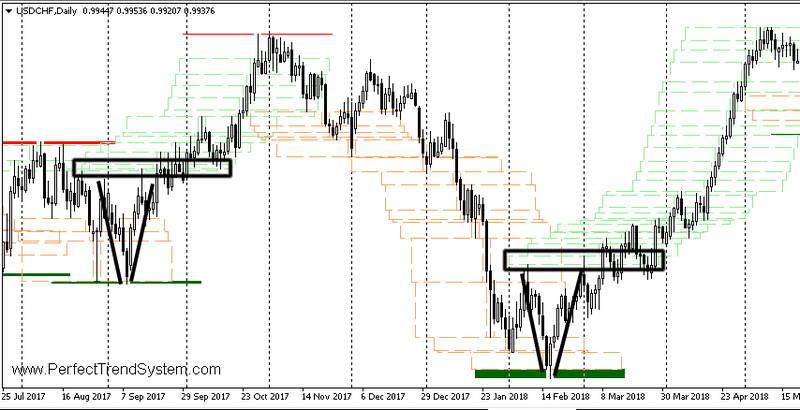 We all know that in the forex market and in most other liquid markets the biggest moves occur during the London and during the New York session. Both sessions overlap. Therefore, the biggest move of the day will nearly always occur between 7 GMT and 20 GMT! During the Tokyo session which begins at 23 GMT the market usually doesn't only moves slowly and most of the time the market respects the high/low of the day which was set during the London/New York sessions. Because we want to have a biggest possible edge over the market we should only trade the setups which produce an entry signal not too late in the day. Only then we can expect (according to the usual behavior of the market) that a further big move after our entry signal occurs. In my opinion an entry at 19 GMT should be the latest possible entry. 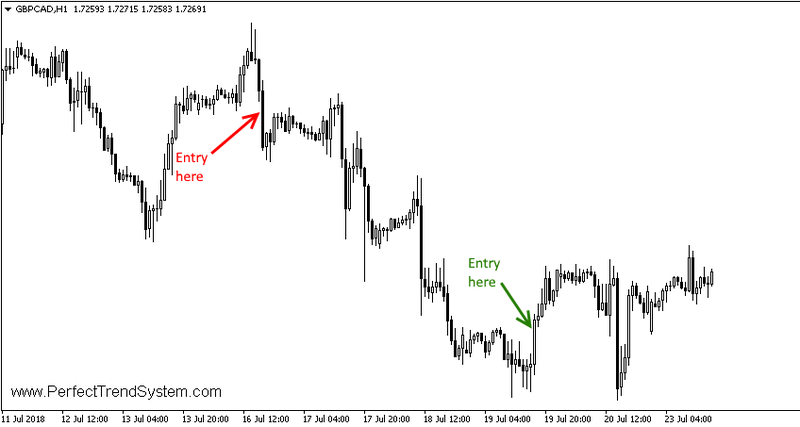 All entry signal after 20 GMT should be avoided because the odds are against a big further move. 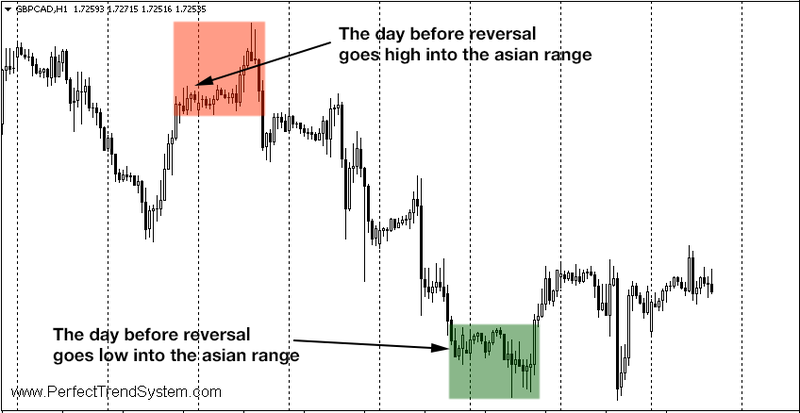 The earlier an entry signal occurs in the day the bigger can be the subsequent move before the market goes into the slow moving Asian session. From the explanations about the trading sessions and when the biggest moves of the day occur we can now define the fifth rule for our high probability forex day trading strategy. This was the last rule which was added to define the V-Power trading system on the signal time frame. 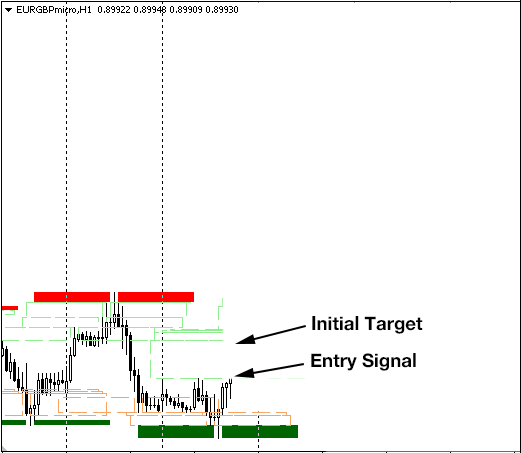 The purpose of the rules is to let you detect high probability setups which give you a big edge over the market. 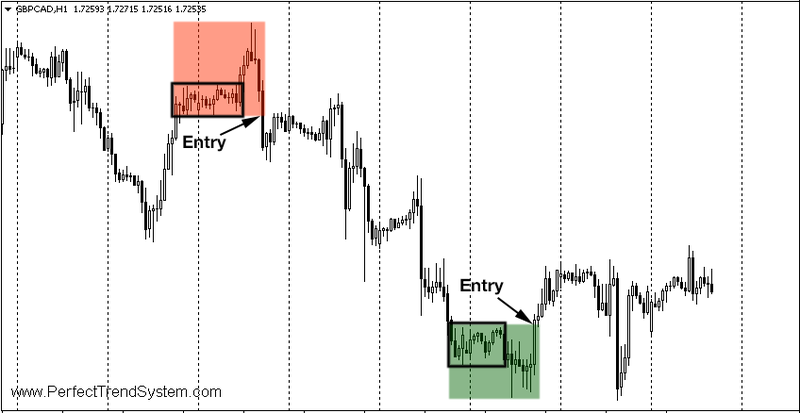 The defined rules are NOT the absolute and only way to detect high probability Level1 entries. With time you will get experienced and you will know what to look for. Then you can slightly deviate from the rules because you will be able to say "OK I take this trade although rule X is not fulfilled. I take it because XYZ adds to the probability of success and therefore it's also a high probability setup". Rule #1: Search only for V-Power Setups after a day which closes near the high / low of the day! Rule #2: A tight range must develop during the Asian session with a duration of 10+ hours! We will now see how the Expert Advisor helps you spotting the highest probability V-Power day trading setups! These rectangles are only drawn if a new high or low is reached and the previous 20 candles did not cover the same price level. As you can see in the screenshot this 20 candle concept in itself is already a great tool to detect the direction of the trend. 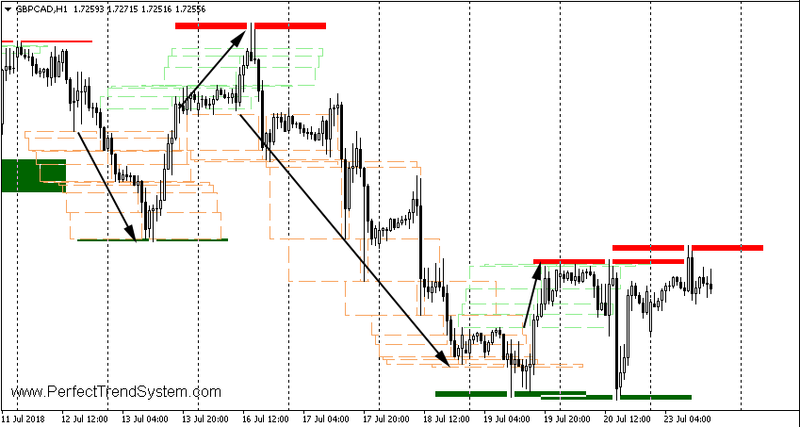 And these rectangles make it extremely easy to detect the high probability V-Power setups! As soon as the first rectangle with a new color is drawn then you directly know that the direction of the trend has changed and that enough time (20 hours) has passed. This trend reversal could be a candidate for a high probability V-Power setup. All you have to do now is to check if all 5 previously discussed rules apply which define the highest probability V-Power setups. You maybe have heard of the saying "The biggest momentum is within the market turning points". And this saying is also true from our point of view on the markets: The old (wrong) positioned traders are exiting their positions in fear, new traders are opening their positions into the new direction and the smart money supports the move into the new direction. As we already saw, the key turning points are indicated by the technical analysis of the V-Power EA very good. But the further you go away from these key turning points the lower the probability will be that the price will reach this price level. This is common sense. With other words: You will have the highest probability of success near the key turning points! Later on this page you will also learn how you can dramatically boost your performance with the V-Power system by using the bigger picture. By using the bigger picture you will join the absolute elite club of traders! How To Exploit The Highest Probability Zones? I know many useful strategies how you can exploit the highest probability zones. With useful strategies I mean, that the rule set for exploiting the high probability zone does NOT drastically reduce or even completely destroy the edge of the highest probability zones. The rule set that you apply should make sense in relation to the size of the highest probability zones. The useful strategies that I know differ a lot regarding the time and effort you need to invest to trade the setups and how easily they can be (at least partly) automated. Most of us retail traders are trading besides a normal day job. The time for spotting the setups and executing the trades is therefore limited. Because I know about the challenges which come with limited time for trading the V-Power EA is especially designed to solve them! So how exactly does the V-Power EA exploit the highest probability zones? A relatively tight target is selected to stay within the highest probability zone. The following screenshot shows the situation for a buy signal. But we will never know how the path of upward trend will look like! As I already said: We will never know how the path of the price will look like within the highest probability zone! And because we will never know it makes a lot of sense to take advantage of every possible path which the price action can produce within the highest probability zone. Therefore,the V-Power EA uses an approach that takes advantage of any type of price movement in direction of the initial target. The default configuration of the V-Power EA uses 4 partly positions to handle the trades. With this approach we are even thankful if a pullback happens, because then we can exit with the trade even earlier as a winner. This trade handling approach ensures a very high winning percentage which makes it emotionally relatively easy to trade with the V-Power EA! The following screenshots are showing how the V-Power EA handles the trades if it is used with default configuration. How long you hold the trades is up to you. The more you gain experience through training in the Strategy Tester and through live trading, the more you will develop your skills and your own trading style. 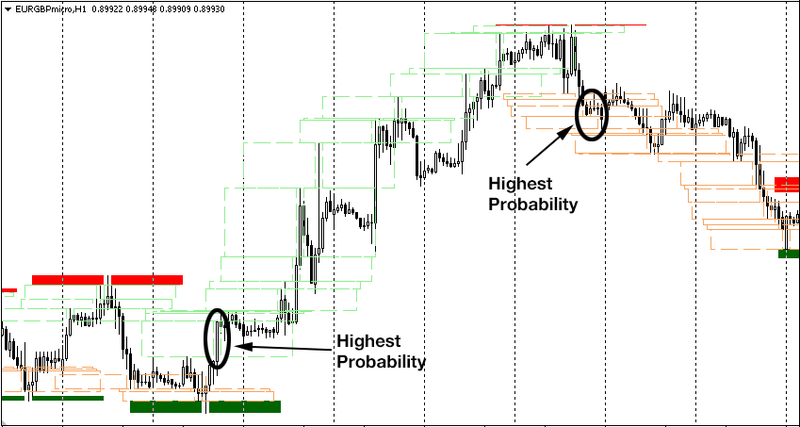 The most important part is that you learn to select the highest probability setups properly. Then you will have a big edge over the market. 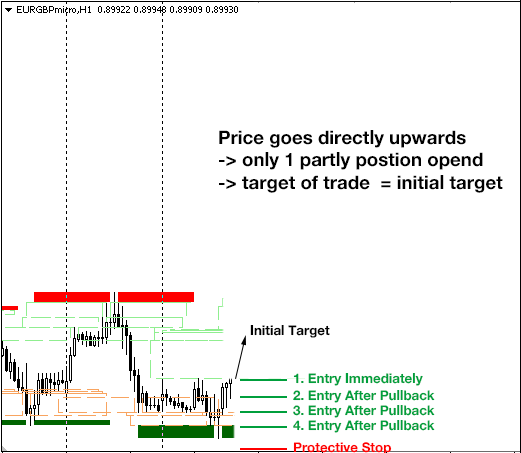 And as you will later see you can dramatically boost the profitability of the setups by using the bigger picture. You can place the trades which are indicated by the V-Power EA manually or you can use the automation possibilities of the EA (semi-automatic entries and trade handling). The V-Power EA has special functionalities to make your live as a retail trader with a normal day job easier. Entering with the V-Power EA can be done directly or delayed. Especially the delayed entries are ideal for traders with a normal day job who can't check the charts during some hours of the day! Because there are many possibilities to enter with the V-Power EA and they all need to be explained in detail, I have devoted an entire article for this topic. You can dramatically boost the profitability of the V-Power day trading system if you select only those setups which are in direction of an edge of the bigger picture! Such trades can be hold longer, days or even weeks! They can produce insanely big winning trades with a decent winning percentage! There are thousand ways to use edges of the bigger picture. I will show you now one good way: The trend of the bigger picture! And again, the technical analysis of the V-Power EA will do that hard work for you: The V-Power EA analyzes the trend of the bigger picture! The following chart shows the daily time frame. And you can see that the EA draws the tops, bottoms and the boxes (which are indicating the direction of the trend) also on the daily time frame. This is a great help to properly analyze the direction of the bigger trend. And what a surprise! 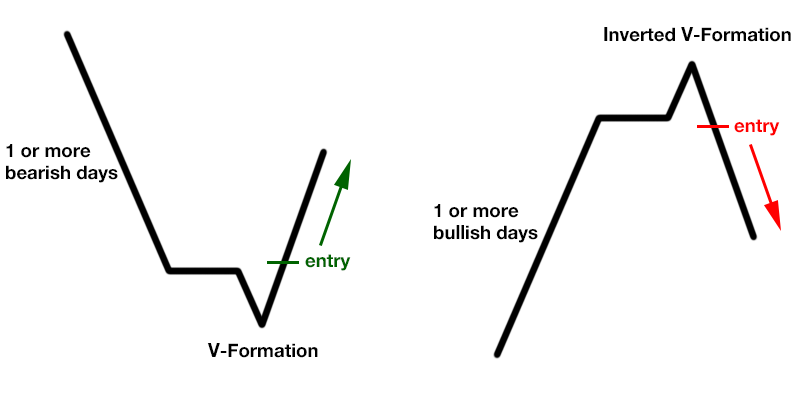 :) V-formations also exist on the daily time frame! And the EA shows you with the boxes when the Vs and inverted Vs are confirmed. Now imagine how big your winning trades can get if you enter directly after a V (or inverted V) on the daily time frame has formed and when you enter with a tiny stop on the time frame H1 with the V-Power entry method in direction of the V (or inverted V) of the daily time frame! These setups are AAA+ quality setups. These trades can be hold for multiple days or even weeks. I don't think you can have a bigger edge over the market as a retail trader. 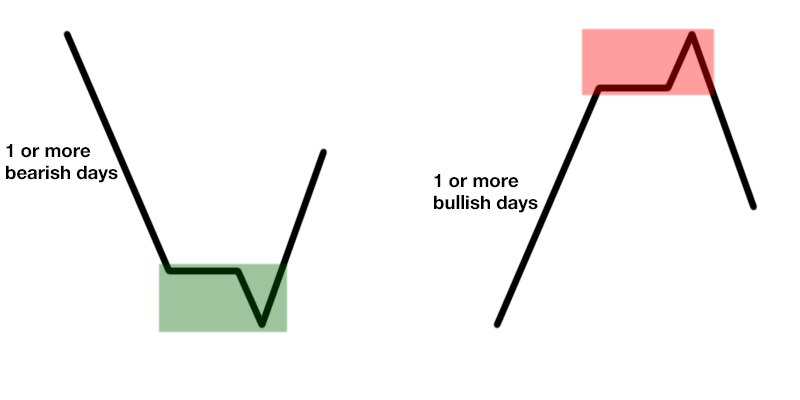 Not all trends on the daily time frame start with a V- or inverted V-formation. But you can easily spot the direction of the trend with the boxes which are drawn by the V-Power EA. Trading in direction of the trend is general a good idea, because on average you will have bigger and stronger moves in direction of the trend. 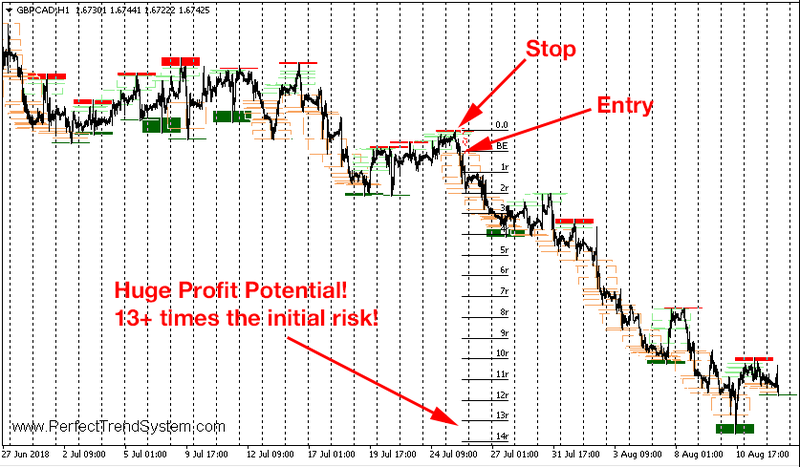 Now you will see an example of a AAA+ trade which had the potential of a 13R winner (1R = the initial risk of the trade). If you would have risked $100 with this trade then you could have earned $1300! 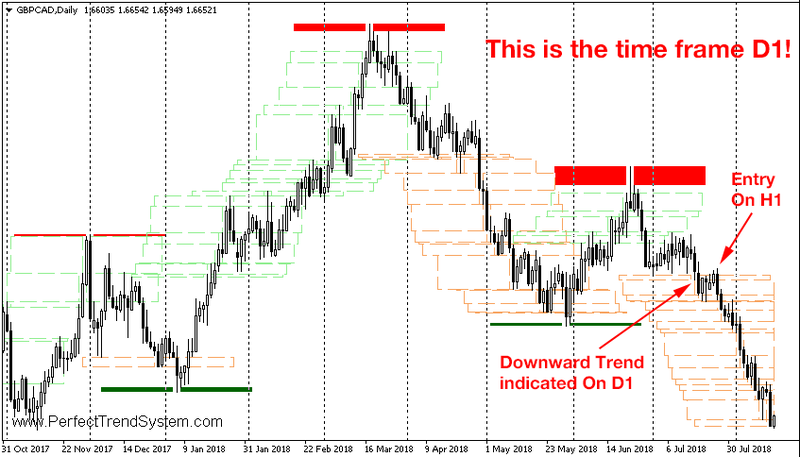 The following screenshot shows the bigger picture, the trend on the time frame D1. The left red arrow labels the point where the downward trend was indicated by the boxes of the V-Power EA. 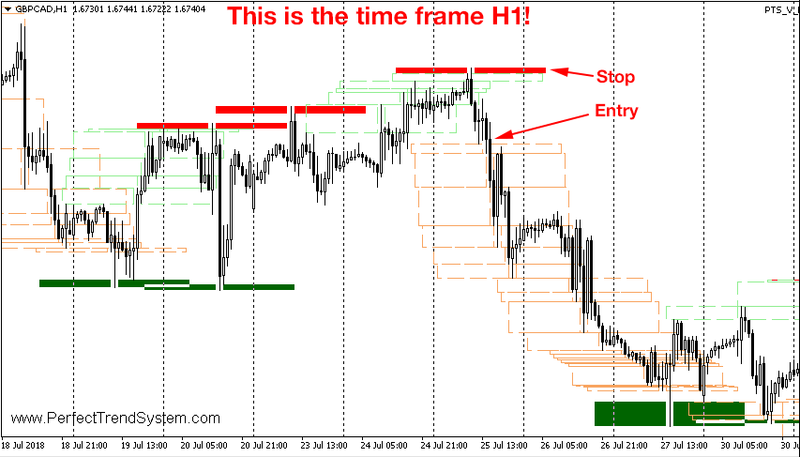 6 days later at the right red arrow we got a V-Power entry signal on the time frame H1. Very important: In relation to the age of downward trend this signal came very early within the trend. Therefore, this signal was an AAA+ signal and can produce huge winners. 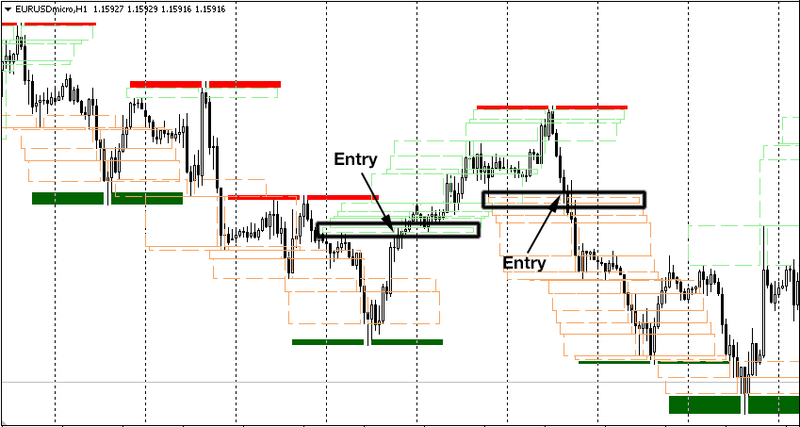 In the following screenshot you can see that this setup could have produced a 13R winning trade. Such big winners can only be achieved with the tight stop of the day trading entry method combined with the trend of the bigger picture. Join today and take advantage of the 20% introductory discount. 7 Days Money Back Guarantee! No questions asked. I will directly refund your money if you request within 7 days after your purchase. Exceptions: If I already answered questions about the system then I invested my personal time and then I can't give you a refund or if you downloaded the free version before the purchase. The V-Power System With 20% Discount Get it now!